AWOL has opened in Provincetown, MA. 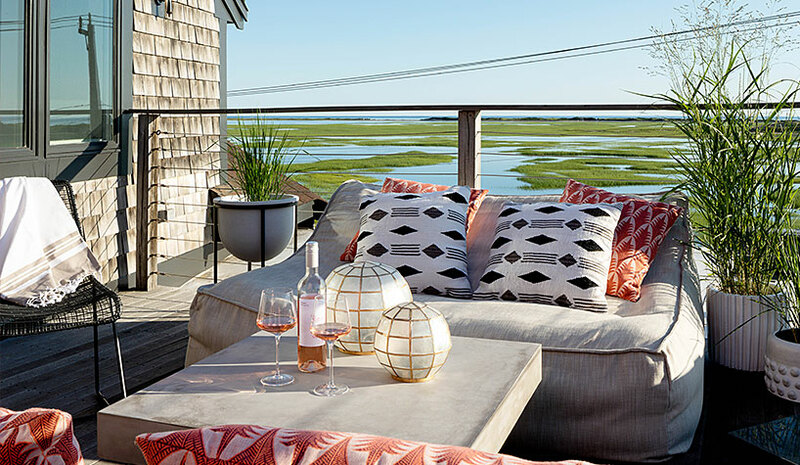 Lark Hotels, a boutique hotel collection with 18 properties throughout New England and beyond, has opened AWOL in Provincetown, MA. Formerly the Inn at the Moors, the hotel’s 30 guestrooms and suites overlook the West End’s scenic tidal waterways. The seasonal property will be open through October in its inaugural year, with plans to reopen in May 2019. Designed by Amesbury, MA-based Butcher & Blood, AWOL’s nontraditional look “creates a blank canvas that highlights the natural beauty of the property’s surroundings.” Each room has a built-in platform bed with untucked microfiber bedding, straw light fixtures, dune grass accents, layered natural fabrics, minimalist black-and-white photography and gray, polished concrete floors. Each of AWOL’s accommodations offer access to outdoor space. First level guest rooms have outdoor hammocks, and day beds on the balconies of each second floor guest room overlook the nearby waterfront. Room types range from the 1,200-sq.-ft. signature Lark Suite to standard king and queen rooms, and double queens for larger groups. Colwen Hotels and InterContinental Hotels Group have opened the Holiday Inn Boston Logan Airport hotel in Chelsea, MA. The hotel offers 124 guestrooms equipped with complimentary WiFi, conveniently located USB-charging-ports, mini refrigerators, microwaves, Keurig coffemakers, 49-in. HDTVs and contemporary bathrooms. The new urban-inspired Aloft Hotel Miami Aventura recently opened, making it the fifth Aloft in South Florida. The 207-room hotel, designed by Boston-based Group One Partners, and managed by Pyramid Hotel Group, is “inspired by the hyper-connected global traveler and emits an industrial aesthetic, sophisticated sense of design and savvy use of space.” The hotel is one of the first entities completed in Aventura ParkSquare, a wellness-centered community. Located on the second floor, the lobby space has urban decor alongside contemporary art creating colorful accents throughout. The lobby is the social hub of the property, and includes an inner salt-water aquarium, grab-and-go eatery, access to the pool deck, pool table, board games, bar and scattered seating supplied with outlets to power up from any spot in the house. Hilton’s new, midscale hotel brand, Tru by Hilton, has opened its latest property, Tru by Hilton Raleigh Durham Airport. The 106-room hotel is owned and managed by Parks Hospitality Group. The new hotel is located in the Triangle near Raleigh, Durham, Cary, Chapel Hill and the Research Triangle Park. Previous ArticleWho Is Buying, Selling, or Financing?